*Not on the original album. On March 9, 1958, five dynamic forces in jazz came together to record what we now know as one of the most profound recordings in jazz history, Somethin’ Else. Each of the players is a leader in their own right and brings their special ingredients to the mix. You can hear Charlie Parker’s influence on Cannonball and how it blends so harmoniously with Miles’ cool jazz style. This album set the stage for much great music to follow. 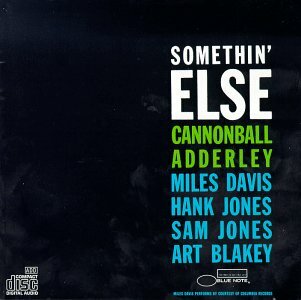 Cannonball played in Miles’ group from 1957-1959. During his tenure, they also collaborated on the classic, Kind of Blue. This entry was posted on Friday, July 25th, 2003 at 8:30 am. It is filed under Flashback Friday and tagged with Art Blakey, Flashback Friday, Hank Jones, jazz, Julian Edwin "Cannonball" Adderley, Miles Davis, Sam Jones, Somethin' Else. You can follow any responses to this entry through the RSS 2.0 feed.